These vanilla peanut protein bars are a variation on Choc Almond Protein Balls, with the same main ingredients but using vanilla bean paste rather than cocoa powder for flavour. Crushed peanuts are also added for texture. 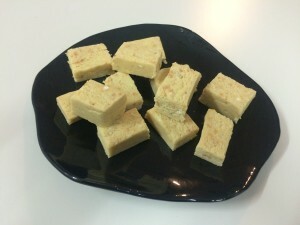 The mixture is then pressed into a tin and cut into bars for easier processing, rather than rolling into balls. The final bar is not overly sweet, but has a high protein and moderate fat content, for sustained energy release. In a small saucepan, warm condensed milk and butter over low heat until butter is just melted, then add vanilla bean paste and mix in well. In a medium bowl, mix skim milk powder, icing sugar, crushed peanuts, coconut flour and almond meal. Pour in condensed milk mixture and mix well. While still warm, press the mixture into a greased, paper-lined square tin and chill overnight to set. Cut into bars and store in refrigerator. Note: the role of protein in sports nutrition can be overstated. Ultimately, the benefit of the protein in these bars is not to build muscle but to provide delayed energy release. It is true that intensive exercise causes muscle damage and that protein is needed to repair the damage. However, the amounts are relatively small. For most people, the deficit from a single exercise session might be covered by a glass of milk or a piece of cheese. If you eat these bars on a long ride, most of the protein will ultimately be converted to sugars and burned for energy. But this will occur at a slower rate than if you had eaten pure sugar, helping you to maintain your effort without a sugar crash.